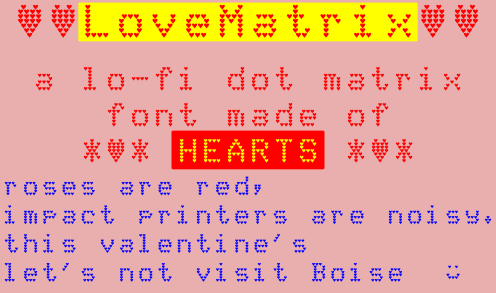 LoveMatrix is a lo-fi dot matrix font made of ♥♥♥s. It’s a seasonally-adjusted version of my mnicmp font. LoveMatrix is a lo-fi dot matrix font made of ♥♥♥s. It’s a seasonally-adjusted version of my mnicmp font. Local copy: LoveMatrix.zip No related posts.